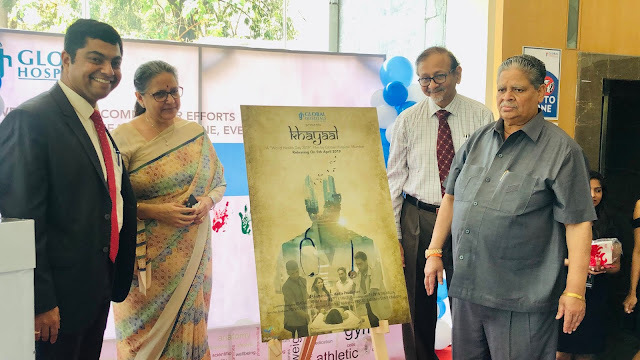 Global Hospital, Parel, Mumbai released a short film ‘Khayaal’ on the occasion of World Health Day, 2019 celebrated on April 7th every year. The theme of this year’s World Health Day is Universal health coverage: everyone, everywhere. A short Video release is an initiative of Global Hospital toInspire the citizens to repose their trust and believe in Hospitals care. Indian healthcare has undergone a sea of change in the recent decade with an increase in infrastructure and availability of super-specialties in the Tertiary care Hospitals. Through his film ‘Khayal’, Global Hospital wants to highlight that comprehensive quality healthcare services should be accessible to all without any kind of discrimination and applauds the services Tertiary care Hospitals provide. The film was shot in the Hospital and showcases the Hospital’s commitment to the overall health and well-being of the society. Global Hospitals, located at Lower Parel, Mumbai is the latest addition to the geographical footprint of Gleneagles Global Hospitals India. The 450-bed facility comprises of 17-stories, housing state-of-the-art infrastructure and advanced medical care facilities. The hospital offers end-to-end clinical, surgical and diagnostic services. The Hospital offers advanced Endoscopic procedures, Hepatobiliary and Liver Surgeries, Surgical and Medical Gastroenterology, Bariatric Surgery and Transplants. The hospital is a centre of excellence for Orthopaedics, Joint Replacement, Knee Replacement, Hip Replacement surgery. The hospital has round-the-clock services for Emergencies, Critical Care and Trauma. Gleneagles Global Hospitals has multi-super specialty hospitals in Bengaluru, Hyderabad, Chennai and Mumbai. The brand is the most preferred hospital group for multi-organ transplants in Asia region. The parent entity of Gleneagles Global Hospitals is IHH Healthcare, a leading premium integrated healthcare provider with a network of 84 hospitals and more than 16,000 licensed beds. It is one of the largest healthcare groups in the world by market capitalization and is listed in the Main Market of Bursa Malaysia and Main Board of SGX-ST. IHH is a leading player in the home markets of Malaysia, Singapore, Turkey and India, and in their key growth markets of China and Hong Kong.